Baby is so charming that various vendors in this West African market gift him all sorts of yummies. Baby rides on Mama’s back, held snug by a bright cloth wrap. Mama navigates the busy, colorful outdoor market, her woven basket balanced on her head. 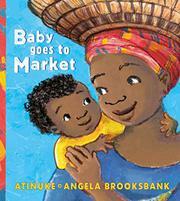 The text unrolls rhythmically in Atinuke’s storyteller’s voice: “Market is very crowded. Baby is very curious. Baby is so curious that Mrs. Ade, the banana seller, gives Baby six bananas.” Baby eats one and puts the remaining bananas in Mama’s basket. All the while Mama shops, unbeknownst to her, vendors continue to respond to Baby’s transparent delight with five oranges, four “sugary chin-chin biscuits,” three “roasted sweet corn,” and two pieces of coconut. With each delicacy given, Baby eats one and puts the rest in the basket. When Mama sees all the extra foodstuffs she didn’t buy, she’s concerned, until the vendors reassure her: “We gave those things to Baby!” In her debut picture book, Brooksbank offers bright, bustling tableaux of shoppers, vendors, and goods. The smiling, all-black cast sort through myriad wares, while the text keeps up its rhythm, introducing both typical items bought in a West African market and a gentle lesson in arithmetic as Baby alternately snacks on and stashes his gifts.